Though I’m pretty sure a bunch of people expected it already. Okay, no novel updates this week. I’ll update if I manage to complete The Day After by the end of next week, but I’ll just let skip another week if I can’t. So can I assume c1 means Chapter 1, and there’s more to come? Yeah, new chapter comes every two months in dengeki bunko magazine. But nobody knows when raws will be available. Assuming it even gets scanned. I wonder if I could re-translate your word of SAO-Girls Ops into spanish? I’ll put yourcredits. PS: What’s suppose to mean “Ops”? like in Oops! ? Refer to my About page on the right. It’s “Girls Ops” written in katakana and pronounced that way (in English). Do I have your permission? Well, yeah, like it says there, go ahead. Oh, now I get it I took “right” like “right/left” haha. This was an interesting and, moreover, amusing chapter. Too bad it was so short. Well, thanks again for the wonderful translation, Tap-san! (>u<)b You're the best! Well, the next issue’s releasing on 10th August. No idea when it’ll get scanned, though, if ever. Thanks for all your hard work. Really appreciate it! That was really an enjoyable read. Thank you Tap. Poderia me dizer os nomes das fontes que você usou nesse projeto. Gostaria de usar as mesmas, quando eu traduzir para a língua portuguesa! font ou typography da sua versão em inglês! 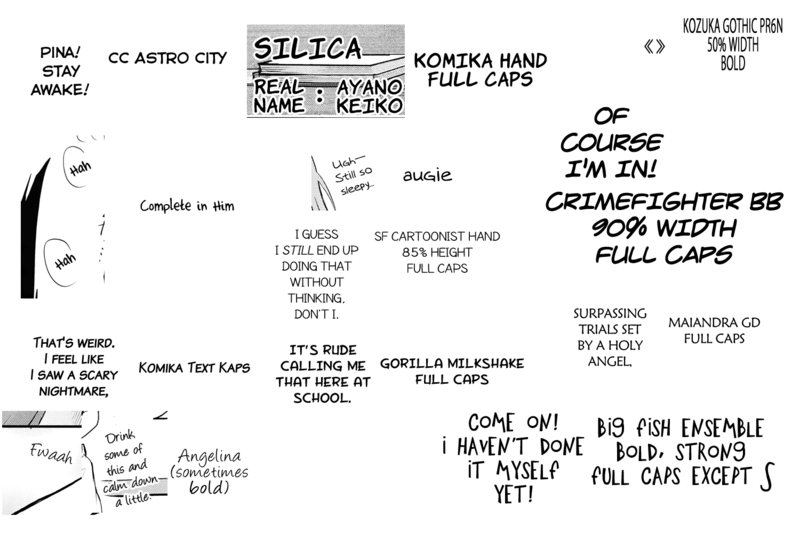 There are at least 10 fonts used in this chapter. I’m expecting you to like fonts, if you’re actually bothering with this. Well, if you like typography, it shouldn’t be too hard. If you need any specific ones identified, just ask. Não estou encontrando a font “Angelica”, pode me mandar o link para eu fazer download? Ah, oops, made a typo there. Three languages, but yeah, I’m just using Google Translate for this. I am wondering if I could re-trans thís to Vietnamese? Refer to the About page on the right..